Join Penn’s Village as we tour this new neighbor. The granite-clad Temple has been designed to complement our City’s architecture. 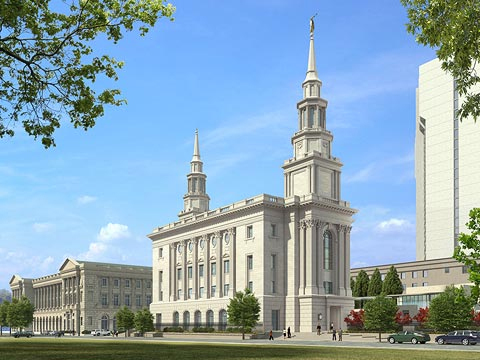 The spires, for example, are reminiscent of the clock tower on Independence Hall, and the period furnishings inside the temple have been planned to echo historic Philadelphia. Other features include panes of stained glass that run the length of the building and an exterior landscaped plaza with a reflecting pool and gardens. The Philadelphia Temple is the first in Pennsylvania and is located at 1739 Vine Street. Tours begin at the LDS Chapel across the street from the temple and will last approximately one hour. They request modest attire and suggest comfortable shoes. Photography, recording and packages or similar items are not permitted within the temple. Please RSVP by calling 215.925.7333 or emailing info@pennsvillage.org. There is no charge for Penn’s Village members and volunteers. We would appreciate a $5 donation from other guests.